The Roman walls of London formed a defensive circuit around the city from as early as 200AD. The circuit stretched for around two miles, and was built after the city's fort was constructed in 120AD. In places, the fort walls were doubled in thickness and increased in height, forming an inpenetrable barrier around the Roman fort and city. The fort and its walls were developed for a further 250 years or so, until around 410, when the Romans finally left Britain. There were a number of gates in the wall, five in total, each aligning with Roman built roads leading to other areas of Britain. The gates were Ludgate, Newgate, Cripplegate, Bishopgate, Aldgate, and most were incorporated into Medieval London's later defences. The construction of London Wall was a high profile project for the Romans, along with Hadrian's wall to the North. It meant that the economic capital of the Western reaches of the Roman empire were defended and secured against any uprising both by British patriots, and Roman rebels. The walls and gates were constructed of Kentish ragstone, brought from Maidstone in Kent. The walls in the most part, stood to around six metres tall and two and a half metres thick, with ditches in front of the walls for added protection. This ditch was around two metres deep and some five metres wide adding a formidable obstacle. There were around twenty towers spread all around the wall, spaced some sixty five meters apart on the Eastern portion of the wall's circuit. With continued raids by Saxon raiders during the late third century, an additional wall was added on the riverside around 280AD. Above. Tower Hill postern gate. Situated just outside Tower Hill tube station, and built into the side of the moat of the Tower of London, this is in fact a medieval structure, widely believed to be built on the site of a Roman gate. The medieval gatehouse collapsed in 1440 due to substandard materials and a lack of decent foundations, and was hence hidden from view until its excavation in 1979. The rest of the photos (below) are of the remains found in and around Tower Hill. 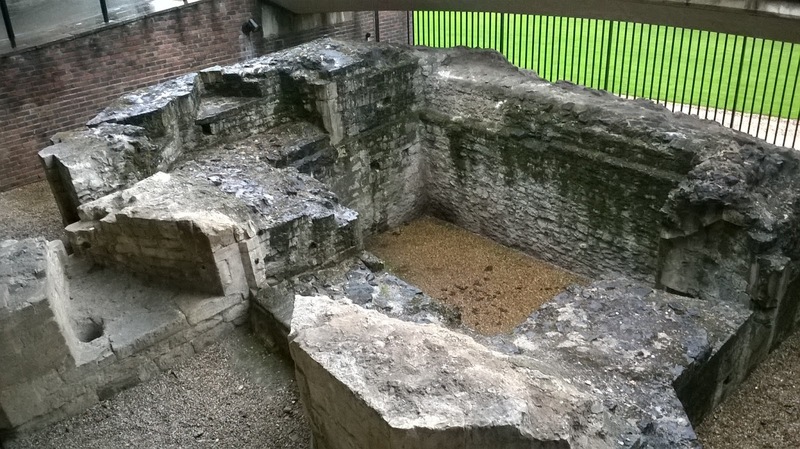 The remains at Tower Hill are some of the highest surviving fragments of the Roman defences. However, what can be seen here is not all Roman, but a combination of Roman and medieval stonework. Some four metres from the floor up (and buried to some considerable depth) is Roman, whilst the remaining height (up to ten metres) is medieval. Such was the strategic importance of the Roman fort, and the sturdiness of the Roman foundations, that the medieval builders saw fit to incorporate surviving Roman masonry into the walls of London in later years. The original Roman wall would have stood to around six metres high. As mentioned above, the wall was also strengthened by the addition of the deep ditch and large number of towers. We're quite lucky to have even these sections of Roman wall to marvel at today. Photos of old London show buildings utilising the Roman walls, with the ancient masonry forming parts of houses and wharehouses. After the 'modern' buildings were demolished, the Roman masonry remains were consolidated and preserved. There are some great photos of the Roman walls here A London Inheritance. Above. Reproduction of Roman inscriptions found near the site at Tower Hill. To be honest, finding the remaining portions of Roman wall was more satisfying that visiting the well trodden tourist attraction of the Tower of London. It's amazing to think that these relics were here during the earliest and violent days of Roman Britain, and have survived being battered and dug up, incorporated into houses and other buildings, have witnessed their neighbours being demolished, and have withstood the constant development and change that has swamped London for the past thousand years. My next visit to London will undoubtedly incorporate a further walk around the other areas of the Roman wall.